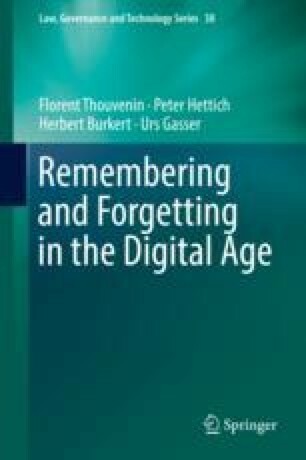 When mentioned together, remembering and forgetting are usually regarded as opposites: we remember what we do not forget, and we forget what we do not remember. They are also commonly perceived in conjunction with time: we may or may not remember a past event and usually the probability to forget a fact increases with the amount of time passed since we last recalled it. However, it is less the amount of time that is significant here, but more the notion that with the amount of time passed, the forgotten item is displaced by other pieces of information whose number increases with time. In such cases, we forget in the sense that we purge information to accommodate new incoming data. Nonetheless, I will later discuss remembering and forgetting not in time-related cases but rather in terms of informational resolution. In this sense, a picture with high pixel density is a higher resolution image (remembering), while a low pixel density image is one of lower resolution (forgetting). It is important to note here that whatever the case, even the smoothest higher resolution image can be put together by means of a sufficiently high yet finite number of simply specified pixels. In other words, we can forget a high amount of information without affecting the quality of what our eyes perceive.